Last Saturday, Alicia's House Food Pantry hosted their annual gift and food basket event. Mayor Gonzalez and the Chicago Heights Police Department volunteers made Christmas wishes come true for some local families. Mayor Gonzalez and his wife Carmen are longtime supporters of Alicia's House outreach events, and CHPD partners with Alicia's House to spread holiday cheer. For the past 8 years, Chicago Heights police officers have volunteered and delivered holiday baskets to families throughout the city. 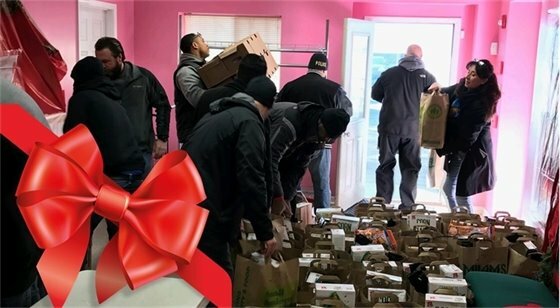 This year, 22 officers delivered turkeys and all the trimmings for a holiday meal to local families. Alicia's House was founded in 2001 by Juan and Stella Hernandez, in honor of their granddaughter who died in a home accident. The pantry serves area residents in a number of municipalities.